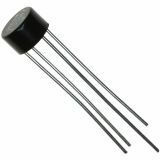 Bridge Rectifier 0.5A, 48V, UO5JB48 Bridge Rectifier UO5JB48, 0.5 A / 48 V.
Bridge Rectifier 0.6A, 600V, КЦ402Ж Single phase bridge rectifier КЦ402Ж, 600 V / 0.6 A.
Bridge Rectifier 1A, 200V, S1VB20 Single phase bridge rectifier S1VB20, 1 А / 200 V.
Bridge Rectifier 1A, 400V, DB104 Single phase bridge rectifier DB104, 1 A / 400 V.
List Price 0.30лв. VAT Incl. 0.27лв. VAT Incl. 0.24лв. VAT Incl. 0.21лв. VAT Incl. 0.20лв. VAT Incl. Bridge Rectifier 1A, 1000V, DB107 Single phase bridge rectifier DB107, 1 А / 1000 V.
Bridge Rectifier 1A, 5000V, UGB6124AG Single phase bridge rectifier UGB6124AG 5 kV / 1 A.
Bridge Rectifier 1.2A, 400V, KC405АТ Single phase bridge rectifier KC405AT, 400 V / 1.2 A.
Bridge Rectifier 1.5A, 100V, W01M Bridge rectifier, single phase model W01M, 1.5 А / 100 V.
Bridge Rectifier 1.5A, 200V, W02M Single phase bridge rectifier W02M, 1.5 А / 200 V.
Graetz circuit 1.5A, 400V, W04M Single phase bridge rectifier W04M, 400 V / 1.5 V.
Bridge Rectifier 2A, 400V, KBP204 Single phase bridge rectifier KBP204, 400 V / 2 A.
Bridge Rectifier 2A, 1000V, 2W10M Single phase bridge rectifier 2W10M 2 A / 1000 V.
Bridge Rectifier 2A, 1000V, KBP210 Single phase bridge rectifier KBP210, 2 A / 1000 V.
Bridge Rectifier 3A, 100V, B2M1-3 Single phase bridge rectifier B2M1-3, 3 A / 100 V.
Bridge Rectifier 3A, 400V, BR34 Single phase bridge rectifier BR34, 3 А / 400 V.
Bridge Rectifier 4A, 400V, KBL404(RS402L) Single phase bridge rectifier KBL404(RS402L), 4 A / 400 V.
Bridge Rectifier 4A, 800V, GBU4K Single phase bridge rectifier GBU4K 4 А / 0.8 kV. 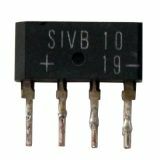 Bridge Rectifier 4A, 1000V, KBL410 Single phase bridge rectifier KBL410, 4 А / 1000 V.
Bridge Rectifier 5A, 100V, B2M1-5 Single phase bridge rectifier B2M1-5, 5 А / 100 V.
Bridge Rectifier 6A, 400V, KBPC604 Single phase bridge rectifier KBPC604, 6 A / 400 V.
List Price 1.20лв. VAT Incl. 1.14лв. VAT Incl. 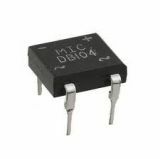 A bridge rectifier is single-phase and has four diodes, incorporated in its arms. 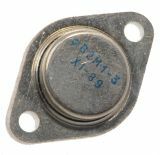 It is used for voltage rectification. The secondary winding of the transformer is connected to one of the scheme diagonals, and the load is connected to the other. It performs double-way rectification, i.e. it rectifies both half-periods of the input sine wave.